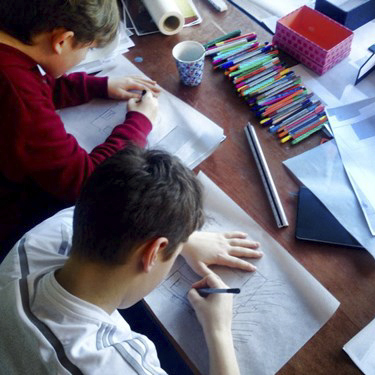 Last week, arki_lab’s Mathies continued work with the young students at Vesterbro Ungdomsgård who are participating in our architecture and design after-school club. Vesterbro Ungdomsgård is an inner city youth club that offers extra-curricular activities for local kids. Along with the more standard options of playing football and music, the Ungdomsgård wants to offer more innovative and creative activities. This is where arki-lab comes in. 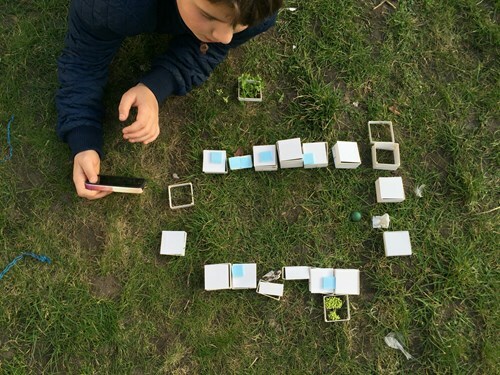 Two months ago, arki_lab starting a collaborative design project with a small group of 4th graders (around 11 years old), with the aim of improving the centre’s facilities, specifically a redesign of an open, undefined field. In this most recent workshop, we started to make some small models from the ideas generated from previous sessions. These took the form of small, stackable crates that could be used in many different ways – from gardening boxes to creating pitches and courts for different sports. Prototyping is an important part of our design process which allows us to see how citizens’ ideas work in the space, how they can interact with each other and create different possibilities. We are therefore one big step closer seeing the imagination of these young designers become physical realities, ultimately transforming their environment. See more on our use of this tool in this special post on prototyping. In the following workshops, these small models will turn into full-size examples with the help of a craftsman, and then placed out in the field for further observation and analysis. We will also create a scale model that will give a more strategic overview of the site and allow for a clear presentation of the project on its completion. We are excited to see what will come out of this process. Keep an eye on our blog to see where it leads!